Dorothy Richardson was born into a middle-class family in the small town of Abingdon, just south of Oxford. Her father lost most of his money when she was teenager and the family moved to London, where she attended a progressive school influenced by the ideas of John Ruskin. At seventeen, when the family’s financial situation deteriorated further, she went to work as a teacher in Germany, then as governess and teacher in England and eventually as a receptionist in a dental surgery in Harley Street. While working in London in 1890s and early 1900s, Richardson lived in lodgings in Bloomsbury and associated with writers, political radicals, and European exiles. Several of the men and women she had relationships with at this time figure in her long prose work, Pilgrimage: for example, Benjamin Grad (Michael Shatov in Pilgrimage), Veronica Leslie Jones (Amabel) and H.G. Wells (Hypo Wilson). Her affair with Wells resulted in a miscarriage and this seems to have precipitated her decision to become a writer. Her writing career began with reviews and essays and journalism in small periodicals. She published a series of short pieces in the Saturday Review between 1908 and 1914 before beginning Pilgrimage, the first part of which, Pointed Roofs, was published in 1915. She married the artist Alan Odle in 1917. Largely unrecognised in his own lifetime, his pen and ink drawings are now collectors’ items. 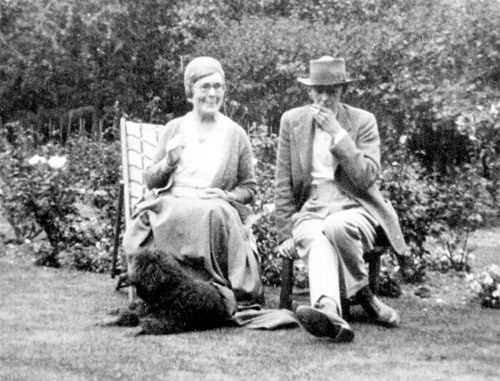 Odle was an important influence on her work and, although few letters between Richardson and Odle survive, it is clear from his surviving correspondence that he and Richardson shared many ideas about literature and art. From 1917 until 1939, they spent their winters in Cornwall and their summers in London. In the 1930s, Richardson was active in support of refugee writers from Germany. They stayed permanently in Cornwall from 1939 until Odle’s death in 1948. She did not leave Cornwall until she was moved unwillingly to a nursing home in Kent in 1954. She died in 1957. Richardson was one of a select group of writers who changed the rules of prose fiction at the beginning of the twentieth century. With James Joyce in Ireland, Marcel Proust in France, William Faulkner in the United States and, in England, Virginia Woolf, Richardson invented a new form of writing. She can claim, with Proust and Joyce, to have been at the forefront of a revolution in literature. The first ‘chapter’ of her long work, Pilgrimage, was begun in 1912 and published in 1915, two years after the publication of the first volume of À La Recherche du Temps Perdu, a year after the first appearance of A Portrait of the Artist as a Young Man, and seven years before Woolf’s first experimental novel Jacob’s Room. The first ten ‘chapters’ of Pilgrimage were published by Duckworth at lengthening intervals between 1915 and 1931: Pointed Roofs (1915); Backwater (1916); Honeycomb (1917); The Tunnel (1919); Interim (1919); Deadlock (1921); Revolving Lights (1923); The Trap (1925); Oberland (1927); and Dawn’s Left Hand (1931). Extracts from Interim were published in The Little Review 1919-1920. The eleventh chapter, Clear Horizon, was published by Dent in 1935. In 1938, Dent published a four volume edition that included a new ‘chapter’, Dimple Hill. In 1967, Dent and Knopf published a new edition simultaneously in Britain and the United States that included the unfinished ‘chapter’ Richardson had been working on until 1953, March Moonlight. In 1979 Pilgrimage was recognised as a feminist classic with the publication of a Virago paperback edition. Although a number of critical terms have been used to describe Pilgrimage, Richardson was unhappy with May Sinclair’s description of her work as ‘stream of consciousness’. In fact, she denied that she was writing a novel at all. Novels, in Richardson’s opinion, always suffered from being ‘conducted tours’. Pilgrimage in contrast gradually develops its own aesthetic, always deferring either an ending or narrative resolution. Richardson also published short stories in a variety of periodicals (a collection was published by Virago in 1989) and a handful of poems. She was the author of numerous articles in periodicals such as Adelphi and Vanity Fair. She began her literary career reviewing for the vegetarian journal, Crank. Between 1912 and 1921, she wrote a regular column, ‘Comments by a Layman’, for the Dental Record. She translated eight books into English from French and German. Between 1927 and 1933 she published 23 articles on film in the avant-garde little magazine, Close Up. Richardson’s aesthetic was influenced by diverse currents of thought. She was part of the alternative, bohemian culture at the turn of the century that embraced vegetarianism, feminism and socialism. Olive Schreiner and Charlotte Perkins Gilman made an early impact on her work and one of her first reviews was of a book by the advocate for homosexual rights, utopian socialist, and Whitmanite poet, Edward Carpenter. Her first book was about the Quakers: The Quakers: Past and Present (1914). The philosophical influences on Pilgrimage included the American transcendentalist Ralph Waldo Emerson, the Cambridge philosopher John Ellis McTaggert, Henri Bergson, and, in the 1930s, the Russian existentialist philosopher Nikolai Berdaeyev. Yet Pilgrimage was not just a novel of ideas. Richardson was deeply marked by her experience of working for £1 a week in London at the turn of the century. Her literary aesthetic was always concerned with the relationship between women’s work and art. A semi-autobiographical work, Pilgrimage covers the life of its protagonist, Miriam Henderson, from early childhood to the moment she becomes a writer. In its succeeding epidsodes, London is an ‘elastic’ material space that facilitates Miriam’s public life. London’s streets, cafés, restaurants and clubs figure largely in her explorations, which extend her knowledge of both the city and herself. Uncomfortable with, even hostile to, the nineteenth-century conventions of femininity, Miriam seeks a third space between masculinity and femininity, developing a new and evolving form of gendered identity that is enabled by the possibilities the city offers.